In the 1950s, what do you do when you want one of the world's most famous architects to design your house? If you're Mildred Ablin of Bakersfield, California, it's simple. You write him a letter. In June 1958, Ablin wrote to Frank Lloyd Wright, saying that she had always been thrilled by his work, but there was no representation of it in her hometown. She continued: "We hope to make this home one of fundamental beauty and of functional patterns to supply our needs, both material and intangible." According to an article in the LA Times, her son Robin Ablin recalled that the request was mostly for fun. The family thought he would be too busy and too famous to consider a project in Bakersfield. They were wrong. Much to the surprise of neurosurgeon Dr. George Ablin and his wife, Wright accepted. 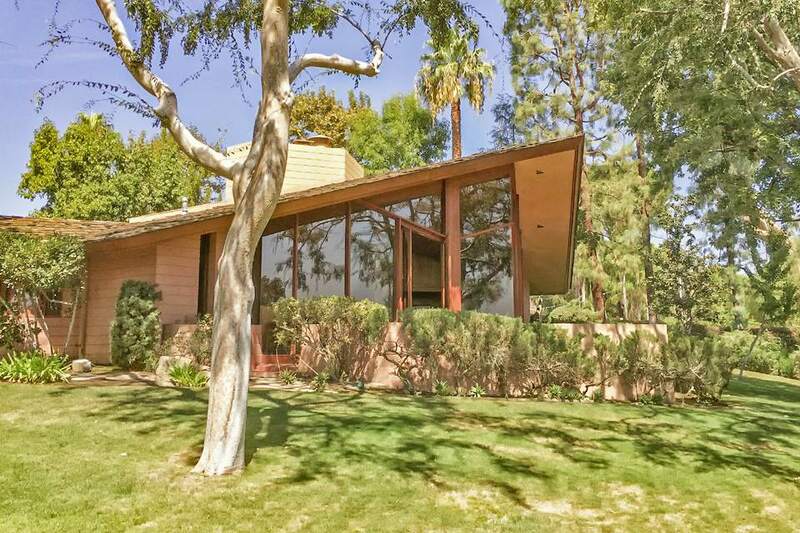 The Usonian style house was designed in 1958 and completed in 1961. It was the next to last house that Wright designed before he died in 1959. The 3,233-square-foot house was designed for a large family with six or seven children, as Mrs. Ablin wrote to Wright. It has five be­drooms, four ba­throoms, li­ving room, di­ning room, kit­chen with fa­mily di­ning bar, of­fice, laundry room, family/playroom, ter­race, patio, sto­r­age buil­ding, and a tri­an­gu­lar-shaped pool. Interior photographs show Wright-designed furniture, built-ins, and a large, open fireplace. Many Wright houses are based on a geometric shape. The Ablin House is created around a diamond motif, with its angles and deep roof overhangs designed to draw in a lot of light. You might think pink is an odd color for a Frank Lloyd Wright creation and you would be right. That color wasn't Wright's original intent, but instead is the result of an accident. Wright's design incorporated the colors of the Sierra Nevada Mountains into its exterior. It was supposed to have gray concrete blocks embedded with purple flecks. Unfortunately, a masonry installation mistake left the blocks with marks that couldn't be removed. By then, Wright had died. The architects at Taliesin concluded that paint was the only solution. The family then chose pink, another color of the mountains. They also adopted it as their unofficial family color. The house remained in the same family until 2009, when it sold after the deaths of its owners for $1.595 million according to CNN Money. Marketing literature at the time described it as an unusually spacious and livable home, ideal for executive entertaining or raising a family. Although the Ablin House isn't ordinarily open to the public, visitors occasionally get inside. Thanks to the generosity of Lamar Kersley who allowed me to use these images, you can see what it looks like. You can see more of his photos on his Facebook page. You can also see photos of the interior and exterior taken by Paul Kiler. To see more interior shots, a copy of Mrs. Ablin's letter, a photo of her with Mr. Wright, and a plan for the house at EstotericSurvey.com. The house is a private residence with no public tours. It is also the only Wright structure in California that you can't even get a glimpse of from the street. In fact, this gate is the only thing you will be able to see from there. You might see it if you play a round of golf on the adjacent golf course. The Ablin House isn't the only Wright site outside California's metro areas. You'll also find several houses, a church, and a medical clinic in some of the most unexpected places. ​Here's where to find Wright sites in the rest of California. You can also see Wright Sites in Los Angeles and in the San Francisco area. Bakersfield's architecture from the 1930s is one of the best-kept secrets in California. Among the interesting buildings you can see are the Fox Theater, the former Seven-Up Bottling Company at 230 East 18th, and the oddly kitschy "Big Shoe" at 931 Chester Avenue.